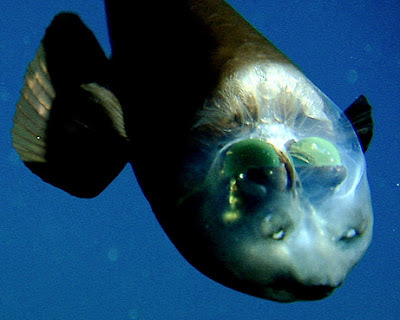 National Geographic has a series of images about the Barreleye, one of the weirdest fish ever seen. Its scalp is actually transparent, showcasing green blobs which are believed to filter light (given that they are located directly above its eyes). According to the artcle, the fish was discovered in 2004: "in the deep water off California's central coast by the Monterey Bay Aquarium Research Institute (MBARI), [it] is the first specimen of its kind to be found with its soft transparent dome intact."